Kathy Shore Nursery's beautiful Christmas trees have been filling the home with Christmas spirit for many years. Along with the traditional Fraser Fir Christmas Tree and the White Pine Christmas Tree, Kathy Shore Nursery is proud to offer something a little bit different. The White Fir, or Concolor Fir Tree, is a beautiful alternative for your home. The Concolor Tree is native to the mountains of the western United States but thrives in the beautiful Blue Ridge Mountains. Kathy Shore Nursery features the Concolor Fir Tree and carefully cultivates it from its early years until its harvest. Like all Fresh Christmas Tree products from Kathy Shore Nursery, the Concolor Fir Tree is a true reflection of great care and dedication to quality. Why choose the Concolor Fir Tree? The Concolor Tree is a wonderful Christmas Tree for the home and for Christmas decorations thanks to its soft needles, excellent needle retention, and bright citrus-like scent. Kathy Shore Nursery's Concolor Fir Trees are perfect for any home or business. We will be happy to palletize your order to save your operation both time and money. We also offer a wide range of handcrafted greenery products from Fresh Christmas Wreaths to Luxury Christmas Garland featuring Fraser Fir, White Pine, and Boxwood mediums. 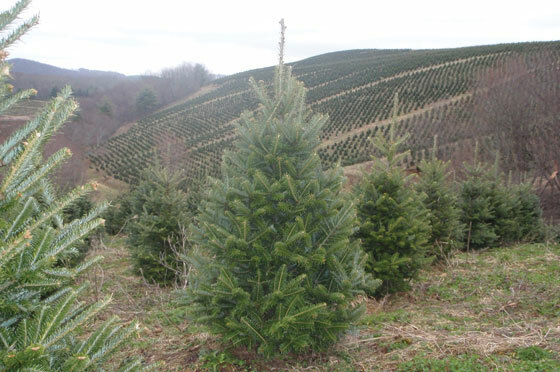 Call Kathy Shore Nursery today for more information on our Wholesale North Carolina Christmas Tree business.